Flow Table for Cement Testing - determining the flow of cement concrete. Consists of a steel table top 76.2cm (30 inch. Dia) Finely machined. The integral cast ribs are designed for support and strength. The stand is fabricated out of cast iron and is of study construction. Holes for mounting in foundations are drilled in the base plate. 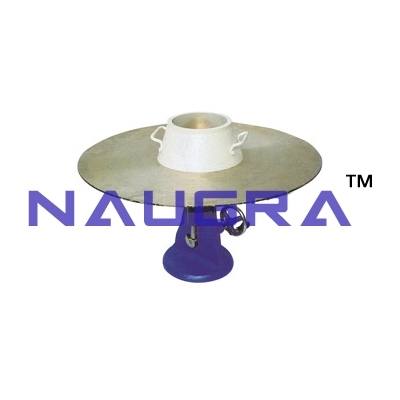 The ground and hardened steel cam is designed to fit and drop the table by 12.5mm. The hand wheel makes it simple to operate the table. Supplied with one conical mould with two handles, 12cm height, having17cm. Inside Dia. at the top and 25cm inner dia. at the base. Complete with a tamping rod 16mm dia x 600mm long one end rounded..
We are leading manufacturers, suppliers & exporters of Flow Table: for determining the flow of cement concrete For Testing Lab for Cement Testing Lab. Contact us to get high quality designed Flow Table: for determining the flow of cement concrete For Testing Lab for Cement Testing Lab for schools, colleges, universities, research labs, laboratories and various industries. We accept bulk orders for government tenders in all countries around the globe.